Based on survey results conducted by Travel+Leisure magazine. Last year Bali was ranked second, as the best island in the world. However, this year Bali was ranked as the sixth best island in the world. Which is not surprising, Boracay Island was ranked second. Beating the island of Bali, the same as last year. Bali is famous as a tourist destination with a unique variety of art-culture, especially for the Japanese and Australian tourists. Bali is also known as the Island of the Gods. In fact, sometimes, more travelers familiar name than the name Bali Indonesia. Indonesia is a country where the island is located. 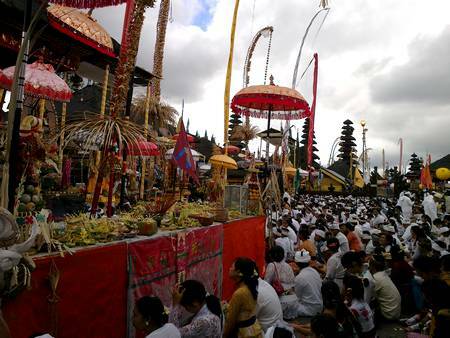 Although visited by many tourists from various countries, Bali still uphold ancestral traditions. That unique Bali. All can be found in Bali's almost like a row of crowded or deserted beach in Kuta, Uluwatu, Nusa Dua and others. Or the right destination also cool off in Ubud or Bangli. Tourists are only an option as you wish. Nature tourism in Bali to further highlight the beauty of the coast, from the crowded beach in Kuta, to the famous beach with dolphins in Lovina, Buleleng. Most beaches in Bali are also a part of the luxury resort, one of which is Kamakandara Beach. Bali became a common tourist destination, meaning that anyone can enjoy the island of Bali. The young traveler or backpacker looking for a lively nightlife can visit Kuta or Legian, with a row of bars and cafes are live throughout the night. The couples who want to honeymoon in peace to enjoy the beauty of Ubud, which is native to the hilly region of green hills and terraced rice fields. Elites can also tour packages luxury with super service.